It is said that after keeping her child in her womb for nine months, when a mother finally delivers her baby, it is in fact a rebirth for the mother as well. There is no help bigger than a mother getting all the facilities while delivering her baby. 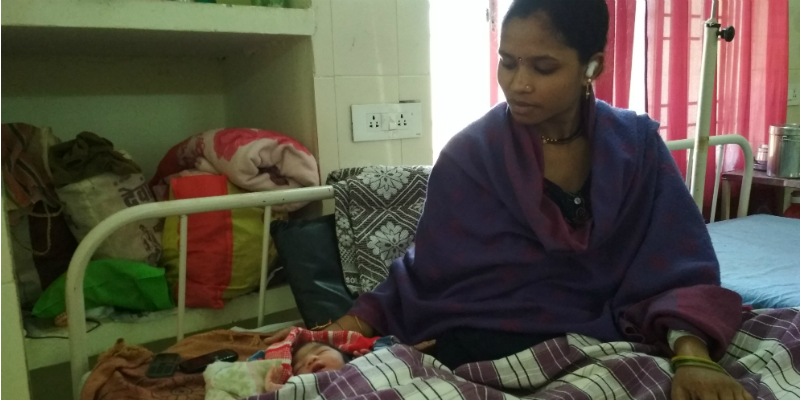 When, Hemlata Thakur, a 25-year-old pregnant woman from Balod, felt unbearable pain, she began to panic. Her husband Anil Thakur was not at home at that time. She didn’t know what to do. That is when her neighbours dialed 102 and called for Mahtari Express. The vehicle reached their house in about an hour’s time and in another half an hour, they got her to the hospital. The delivery was also normal. Both the mother and the child are healthy. It must be mentioned here that Anil owns eight acres of land and his uncle and aunt also live with them. His limited income is barely enough to meet the expenses of the big family. Therefore, the cost of treatment in a private hospital would have been difficult to bear. Even if the baby was delivered on the way to the hospital, there was no complication. Mahatari Express has a trained medical practitioner who can help the mother deliver her baby even in the ambulance. They even have the ability to handle emergency situations. That is why the women's trust in Mahatari Express has increased. The number of beneficiaries from 2013 to 2016 has increased fourfold. In 2013, 4,653 people were benefited, while three years later, it increased to 15,954 in 2016. Hemlata and Anil say that after the call, the staff’s assurance and co-operation was very good and they were convinced that they would reach the hospital on time. Until the ambulance reached, the doctors kept on explaining to them how they can effectively handle the situation. One hour later, the sound of sirens was heard outside the house. Mahatari Express also had a medical practitioner besides the driver. For next half an hour, his presence was very reassuring for Hemlata. Even after reaching the hospital, the staff took them to the ward and returned only after meeting with the doctor. The most important aspect is that Mahatari Express does not only carry the patient to the hospital, but also drops the mother home after she is discharged from the hospital. Anil told that after a week of delivery the Mahatari Express dropped Hemlata and the newborn back to their house. The Chhattisgarh government has provided great relief by setting up this facility. Chief Minister Dr. Raman Singh is a doctor himself, so his thinking involves the priority of the patients. The result of this is that he did better work on the provision of hospitals and implemented facilities such as 102. Hemlata feels that it is because of the Mahatari Express that she and her child are living in peace today. IT would have been impossible for her and her child to survive had the Mahatari express not reached on time.